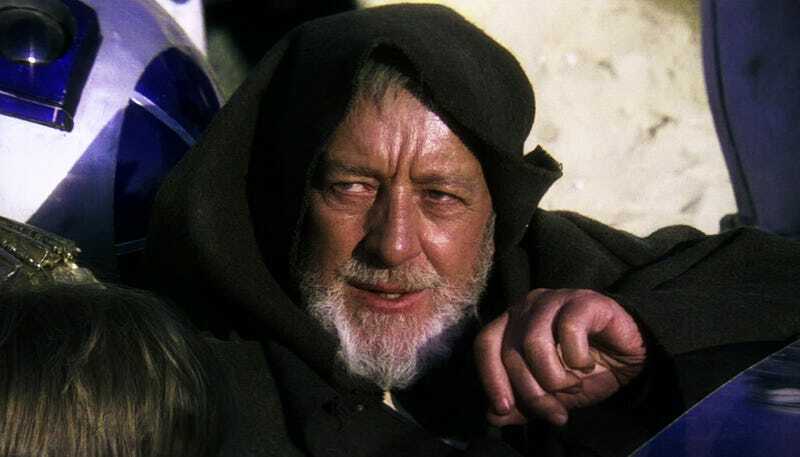 Alec Guinness thought Star Wars was "fairytale rubbish" and Harrison Ford's first name was "Tennyson"
A lot of the credit for the original Star Wars being a decent movie must go to Alec Guinness, who plays Obi-Wan Kenobi and brings a lot of gravitas to explaining the Force and the complicated backstory about the Clone Wars. But Guinness didn't think much of Star Wars when he was filming it — he only took the role after they doubled his pay, and he still griped afterwards. I have been offered a movie (20th Cent. Fox) which I may accept, if they come up with proper money. London and N. Africa, starting in mid-March. Science fiction – which gives me pause – but is to be directed by Paul [sic] Lucas who did "American Graffiti, which makes me feel I should. Big part. Fairy-tale rubbish but could be interesting perhaps. ... new rubbish dialogue reaches me every other day on wadges of pink paper – and none of it makes my character clear or even bearable. I just think, thankfully, of the lovely bread, which will help me keep going until next April even if Yahoo collapses in a week ... I must off to studio and work with a dwarf (very sweet – and he has to wash in a bidet) and your fellow countrymen Mark Hamill and Tennyson (that can't be right) Ford. Ellison (? – No!) – well, a rangy, languid young man who is probably intelligent and amusing. But Oh, God, God, they make me feel ninety – and treat me as if I was 106. – Oh, Harrison Ford – ever heard of him?